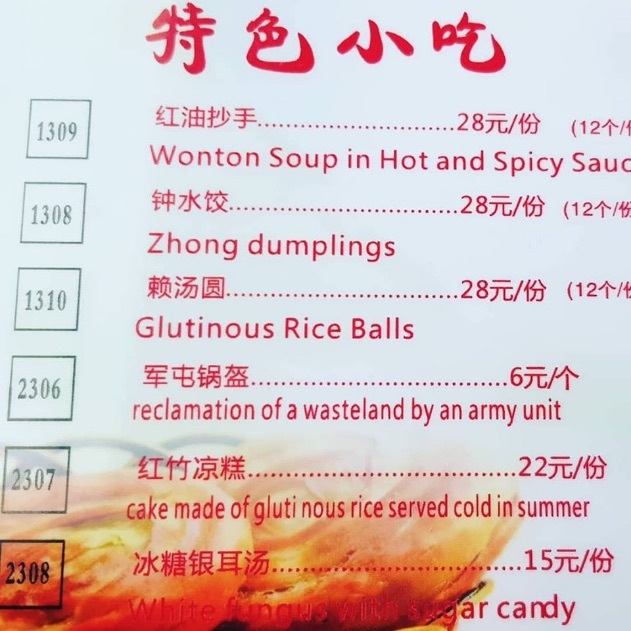 The translation for the mysterious fourth item on the menu, "reclamation of a wasteland by an army unit" is taken directly from Baidu Fanyi for jūntún 军屯. The translator simply ignored the last two characters, guōkuī 锅盔, which literally mean "pot helmet". Guokui is a kind of pancake made from flour from Shaanxi cuisine. It is round in shape, about a foot long in diameter, an inch in thickness, and weighs about 2.5 kg. It is traditionally presented as a gift by a grandmother to her grandson when he turns one month old. The name is sometimes translated as "crusty pancake", though I might suggest "helmet pancake" as an alternative. In this Google gallery of images, you can see the variety of sizes, shapes, and types that go by the name guōkuī 锅盔 (lit., "pot helmet", i.e., "helmet pancake"). As for jūntún 军屯, it refers to army encampments, so this kind of "pot helmet pancake" must evoke memories of being in the field for those who have been soldiers, especially those who served in túntián 屯田 ("military agro-colonies") and bīngtuán 兵团 (“army unit; army formation”) in border regions such as Xinjiang where vast reclamation projects are undertaken. The bread / pancake certainly looks spartan to me. Why not just leave the name of the food untranslated (i.e., "guokui") as is usually done with Indian, Japanese, Arabic, and even Southeast Asian Chinese food names? There is a lot of speculation on-line, in English and Chinese, about the exact identity of a related (possibly fictitious) food: That is 拤饼, from Mo Yan's Red Sorghum, translated as fistcakes. Personally, I believe Mo Yan made up 拤饼 as an evocative word, and there is no specific meaning beyond the generic idea of egg-and-onion 饼. But I would be happy to learn I am wrong about that. Does the word 拤饼 mean anything outside Mo Yan's fiction? 2.5 kg, really? That's five and a half pounds. Must be a dense pancake. Dense? If you assume the foot diameter and inch thickness are precisely accurate the density is a bit under 1.35. However, if the cake is 13 inches diameter and 1.2 inches thick its density is 0.95 (it would float on water). Note the word "about". Whilst I admire Bill B & F for sticking to Imperial units despite the modern world's obsession with "going metric", F's estimates of density as "a bit under 3.5" and "0.95" leave me confused. In what units are these two densities being expressed ? @Philip Taylor quoting https://en.wikipedia.org/wiki/Relative_density: "Relative density, or specific gravity, is the ratio of the density (mass of a unit volume) of a substance to the density of a given reference material. […] It is defined as a ratio of density of particular substance with that of water." Since it is a ratio of two quantities with the same units, it is a dimensionless number; since water is so commonly used as a point of reference, that is often omitted, too. But I made the same mistake, too; I guess it must have been the odd wording of "round in shape, about a foot **long in diameter**, an inch in thickness" that threw me off and made me imagine a round stick one foot (30cm) long and 1 inch (2.5cm) thick. There's no way to make an object like this out of dough and have it weigh in at 2.5kg. But, it's a disk. What strikes me odd is "about a foot long in diameter," I generally encounter diameters being described as widths, not lengths. Either that or I should measure my pancakes with sub sandwiches or hoagies. How frequently does "long and diameter" appear with each other versus "wide and diameter"?